Graphic from the Saudi Communication and Media Center on 26 September 2017 explaining that women are allowed to drive. A royal decree was issued in September announcing that the longstanding ban would end in June 2018. At that time, the Secretary-General and other senior UN officials said they saw the move as an important first step that could lead to increased participation of women in the job market, among other areas of public life. Saudi Arabia ended the prohibition on women driving at midnight on 24 June. “He looks forward to witnessing Saudi Arabia’s continuing journey toward substantive equality for women and girls,” said the statement. 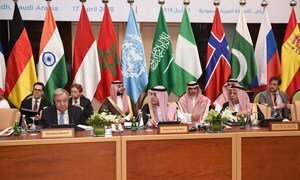 The United Nations chief on Tuesday stressed the importance of preventing terrorism by addressing the root causes that turn grievances into destructive action, as well as the need to sustain the world body’s funding to help countries develop their counter-terrorism capacities.